Fist-sized knots had formed in my quads turning each step into a potential fall, but there was nothing to do except to keep moving up the mountain. No amount of stretching would banish the cramps. And it only got worse when I stood still. Trudging onward, I tugged the zipper of the small pocket attached to my pack’s hip belt, pulled out an electrolyte cube and took stock of our situation while I chomped on it. 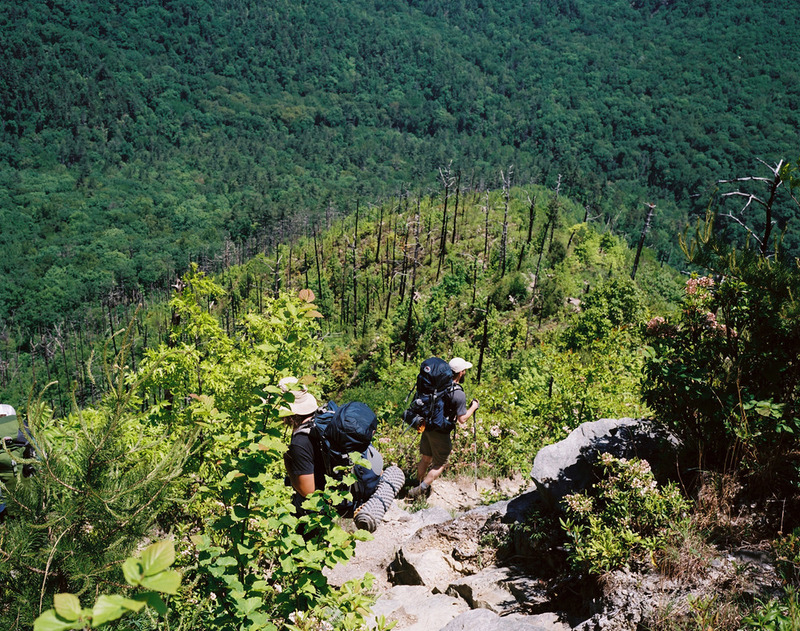 We were five guys with full packs, on our third day of hiking through the Linville Gorge in North Carolina’s Pisgah National Forest. And our water was nearly gone. DAY 1: We made camp at the head of Pinch-In Trail, the route that would take us 1,400 feet down into the ravine they call Linville. There’s a lot of victory language aimed at tough hikes like this: “I conquered the trail. I wasn’t beaten.” But the presumption that nature can be defeated by your presence in it is downright arrogance. You are here at the pleasure of your environment. We were about to learn as much. But for the time being, we enjoyed the camp fire, told stories, crushed more than a few beers, and bedded down for a good night’s sleep. We’d need it. Our collective mood was soaring by the time we made it down the exposed gorge wall to Linville River, where we stopped to wade and have lunch. On the face of it, a trail that follows a river is an ideal pathway. The water is plentiful and the scenery is beautiful. But as we scrambled over fallen trees as the route began to take us back up the gorge wall—then down toward the river, then up again—we discovered why they say a mile here is like two or three elsewhere. The light faded faster than we expected and we were still about a mile (or “three”) from Conley Cove, where we had intended to camp. Tension mounted as our energy plummeted. 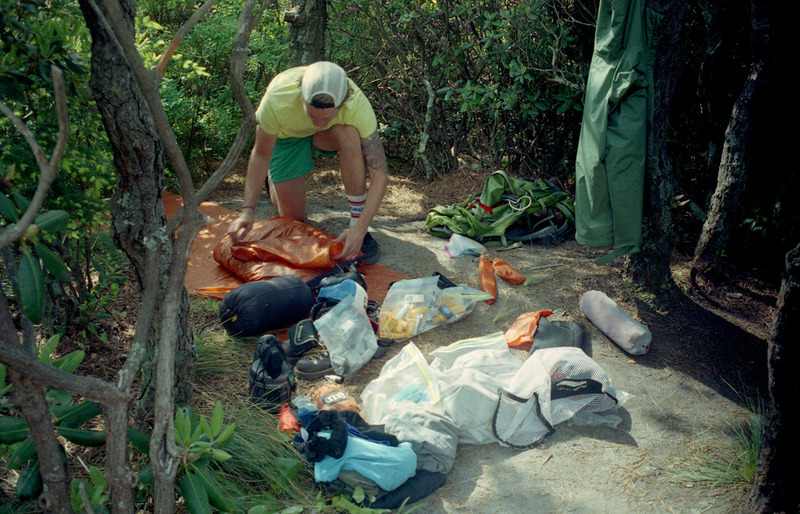 Finally we found a secondary campsite, stacked our hammocks like bunk beds, made a hasty dinner, and went to sleep. DAY 3: Vowing to make better time than the day before, we packed up quickly and headed north, hoping to find the Spence Bridge. The only problem? It wasn’t there. The pylons were still in place, but an actual walkway was long gone, leaving us to figure out how to forge the river without soaking our packs—and the thousands of dollars of camera equipment inside. Once we crossed (using an acrobatic method of leaping from rock to rock and using our trekking poles to transfer the bags), we began our ascent up the other side of the gorge. Things were about to get hairy. First, the trail began to fade. Then the gorge wall became more and more vertical, to the point where we were scrambling up rock falls one step below free climbing. That’s when our legs started giving out. We knew our canteens were getting low, but we were headed straight for a waterfall where we could resupply. Yet the higher we went, the dryer it got. By the time we reached the falls we knew they would be waterless. Between the five us, we had about 9 ounces in our bottles. We forced ourselves to go on, to keep climbing. At the end of a stretch where we gained 400 feet in the span of half a mile, we broke through a thicket of rhododendrons. We stood on the top of Hawksbill Mountain, and in front of us stretched the entire valley. The light turned gold as the sun began to dip. 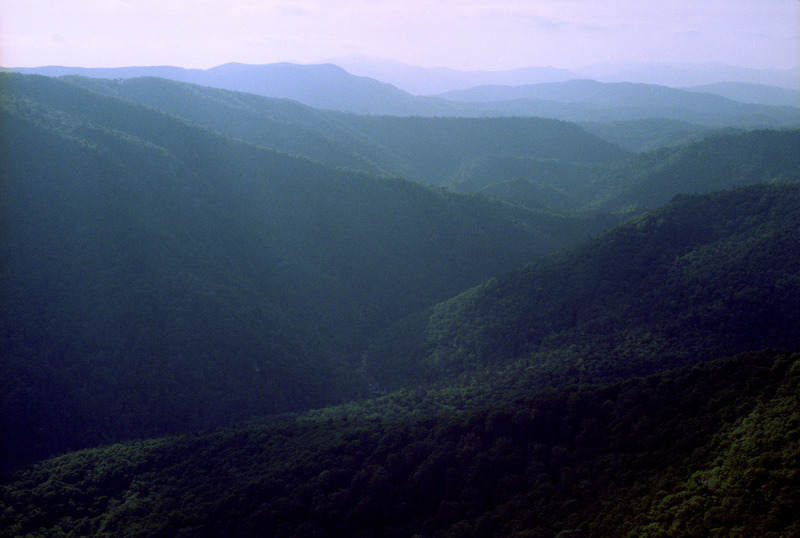 The Blue Ridge Mountains in the distance went from lush green to their namesake hue. We dangled our legs over the cliff’s edge and forgot about our dehydrated bodies for a moment. Instead, we took advantage of the rare opportunity to reflect on life out of doors. Outside, and nowhere else, you bump into your primitive humanity: your basic needs for water, food, and shelter. 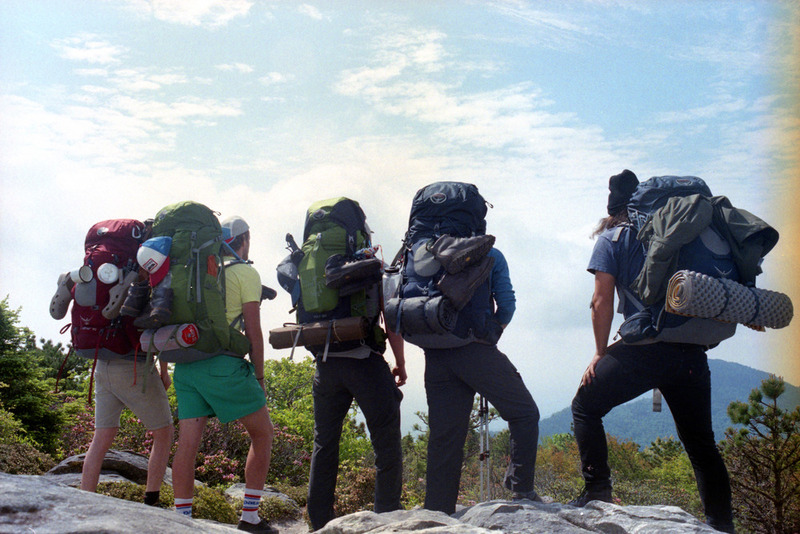 Did we set out into the wilderness as if we had something to offer it? 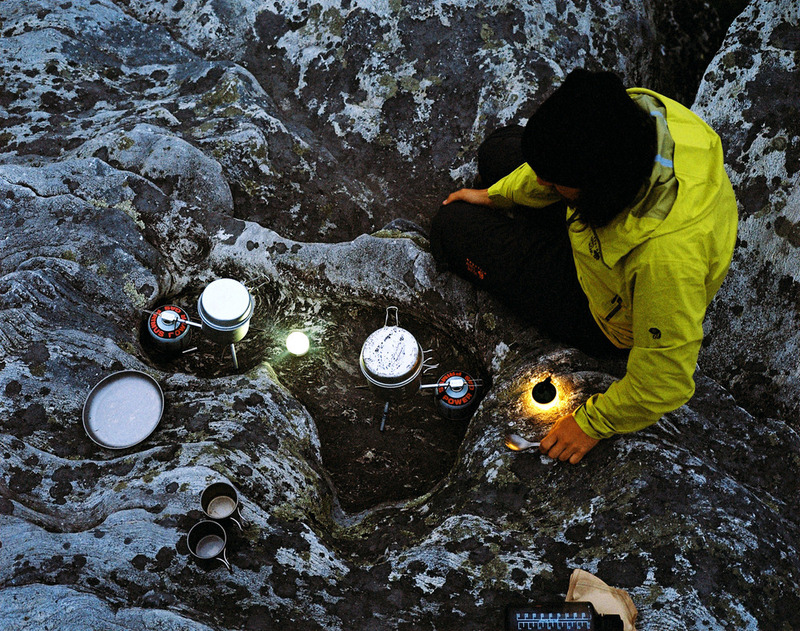 Roughing it in the backcountry demands an element of planning and forethought that modern life doesn’t always require. And even when you’ve done your homework (as we had), the intel might be wrong. The adventure starts when those plans go awry. We made camp on top of the mountain. Tomorrow, we would find the pavement and hitch a ride back to civilization. Then, we would drink. - Seth Putnam, Photos by Jesse Lenz and Kevin Russ. SETH PUTNAM is the editorial director of The Collective Quarterly, a magazine about world discovery based on one geographic region per issue.